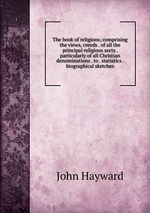 Аннотация к книге "The book of religions; comprising the views, creeds . of all the principal religious sects . particularly of all Christian denominations . to . statistics . biographical sketches"